George H.W. Bush has finally been laid to rest next to his beloved wife, Barbara, and their daughter, Robin, at Texas A&M University after a private, graveside service for his family. After lying in state at the US Capitol and a funeral at Washington's National Cathedral, Bush had a funeral at the Houston church where his family worshiped for more than 50 years. His remains then rode on a special funeral train to College Station, where he was buried at his presidential library at Texas A&M University. Prior to the closed service, about 2,100 cadets in dress uniforms lined the road to the graveside and saluted as the motorcade passed. Earlier on Thursday, thousands of cheering and waving Texans lined the route of the special funeral train traveling 70 miles from Houston. Bush's family, watched somberly as a military honor guard carried his casket off the train. His flag-draped casket was wrapped with a plastic cover due to the rainy conditions. On Thursday morning, an emotional service at St. Martin's Episcopal Church in Houston was held. His body was then transported via the presidential train to the presidential library where he was laid to rest at the private ceremony. 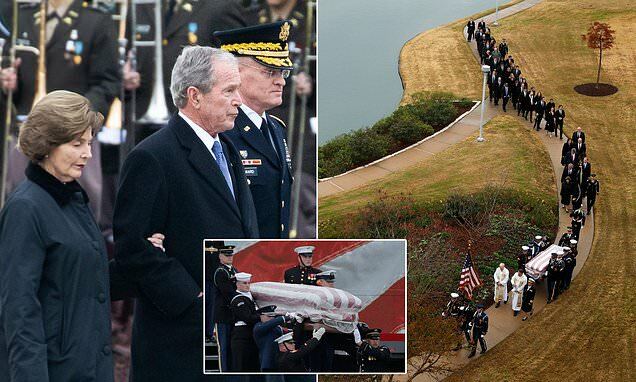 Bush's grandsons were honorary pallbearers and his granddaughters read scripture in a service bursting with faith and family – less about America’s last war-hero president than a gracious, devout patriarch. About 1,200 invited guests included members of the 41st president's family, Houston athletes and civic leaders who knew him as a service-minded American who invested more than four decades in merging his family's values with America's.